The Vanoise was the first French National Park. Situated in the French Alps, it lies south of Chamonix and north of the Ecrins. It’s on the border of Italy with the Gran Paradiso to the east. It is ideal territory for IMLs as it sports a wide range of walks including part of the GR5 and GR55, a large number of easy peaks over 3000m; beautiful Alpine scenery; fantastic plant and animal diversity (Ibex, Chamois and Marmots); interesting geology and glaciers; and good refuge facilities. The Park exists to enhance tourism, local cultural and economic resources and encourage the respect of environment. The park is made up of 3 different zones. The Zone Centrale is a highly protected zone with strict regulations. The Zone Peripherique covers 28 surrounding villages. The Park also has five nature reserves which protect the most representative of the various ecosystems. A wide range of “Day walks” of various lengths and grades are possible from a number of valley bases such as Pralognan and Val d’Isere. Both of these towns have campsites, tourist offices, hotels, shops and banks. It is possible to transfer between the two by bus, as there are regular daily services. It is possible to traverse from Val d’Isere into the Gran Paradiso area via the Col de la Galise. Modane, Termigno and Bonneval also make great bases for day walking from well serviced comfortable B&B type accommodation. For a novice group, a short introductory overnight circular trek can be made to one of the Refuges from any of these valley bases. Longer Treks: The availability of a wide network of good mountain refuges and recognised waymarked paths is ideal for trekking. For example sections of the GR5 and GR55 can be combined to give a 5 day traverse of the Vanoise. 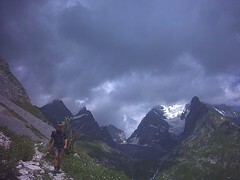 Other popular local long distance treks include Kev Reynold’s “Tour of the Vanoise” from Modane, and the classic “Tour des Glaciers de la Vanoise” from Pralognan (which does not involve any glacier crossing). The waymarking of paths is noticeably less than other places in the Alps. Refuges are typically staffed from mid June to mid September but its best to avoid the overcrowded French Holidays mid July to mid August. Weather tends to be very good throughout spring into autumn, although some of the passes may still be snowbound into June. September can be cooler than mid summer and may give better conditions for a long trekking route. June & July give the best displays of wild flowers. Weather Forecasts are displayed in all the tourist offices. Chambery and Grenoble are the nearest airports, although direct cheap flights are easier to Paris, Lyon or Geneva from the UK. You can then hire a car or take the train as detailed below. Fastest is the TGV from Paris to Lyon, and change for Chambery and Modane. There is a direct Paris to Turin service which stops at Modane. Other local train stations include Moutiers and Bourg-St Maurice. Be aware that French motorways “autoroutes” carry tolls and the French typically drive on the right. The journey can be made almost unbroken on motorways from Calais to Chambery. Didier & Richard 1:50,000 “11Massif & Parc National de la Vanoise”. Valley locations have a wide choice of Bed and Breakfast accommodation, Gites and Small Hotels. The local tourist offices have full details. Refuges are plentiful and good quality, it is highly recommended that you book places in advance. Most belong to the National Park itself (PNV), some to Club Alpin Français (CAF) and others are privately owned. Most provide food in the form of a 4 course meal; usually Soup, a hearty Stew, lots of Cheese & a Pudding. Wild Camping is forbidden in the Park but is tolerated between 1 July and 31 August, for small tents between 7 p.m. and 7a.m at some refuges. This camping is under the control of the refuge warden: a fee is charged and campers may use the toilet facilities. Bonneval-sur-Arc (www.bonneval-sur-arc.com), Bessans (www.bessans.com), Termigno (www.3petitsvillages.com), Lanslebourg-Mont-Cenis, Lanslevillard, Aussois, and Modane. Val d’Isère (www.valdisere.com), Tignes (www.tignes.net), Peisey-Nancroix, and Les Arcs. Pralognan-la-Vanoise (www.pralognan.com), Champagny-en-Vanoise (www.champagny.com), and Méribel (www.meribel.net ). As this is France, a practicing IML should obtain the French “equivalence” for their IML carnet when working there for a longer period of time. There are no particular dangers in walking on the trails in the Vanoise beyond those experienced anywhere else in the middle mountains of the Alps, e.g. occasional late snow patches and afternoon electrical storms. There is very little via ferratta or scrambling on the normal walking routes. However, a walking rope, group shelter, first aid kit and mobile phone are always sensible items to carry. The emergency number is 112 from a mobile phone, but mobile phone reception may be difficult in deep valleys. Fire (( 18), police (( 17) & medical (( 15) services work together closely. The dialling code to France from England is 0033 and from France to England is 0044. Mountain Rescue is not free and specific insurance is essential. France as part of the EEC recognises the European Health Insurance Card for medical treatment.